TRUCKEE - The old, run-down white building by the downtown bridge is highly visible to anyone traversing Highway 267, yet many visitors and even locals are unaware of its significance. Soon to be restored, it's the last remaining structure in what was once the West Coast's second-largest - though short-lived - Chinatown. 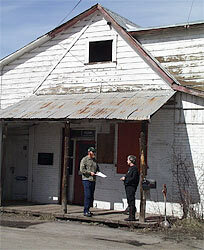 The building was an herb shop and major gathering place from 1878 to 1886. In 1886, a "suspicious" fire destroyed all the other buildings on Southeast River Street. At about the same time, the approximately 1,000 remaining Chinese residents were given the choice of leaving on their own or being shipped out in boxcars by Truckee's so-called "601" vigilantes and the Caucasian League. The 601 vigilante group was formed during a secret meeting one evening in the 1870s by "a group of men, considered Truckee's leading citizens," Joanne Meschery explained in "Truckee," her 1979 history of the town. In the 1880s, the Caucasian League followed "with one goal in mind: ridding the town of Chinese," Meschery wrote. Although not the first center of California's prejudice against Chinese, nor the most violent, Truckee "grew renowned for its successful expulsion of resident Orientals," she wrote. That ugly chapter in Truckee's history came during an economic downturn that resulted in a boycott of Chinese labor, said Gordon Richards, research historian for the Truckee-Donner Historical Society. Truckee's original Chinatown was a crowded shantytown on the steep hillside between Brickelltown and High Street, just west of Commercial Row, the downtown shopping area along what is now Donner Pass Road. The area suffered many fires, some of which were of suspicious origin, said Richards. When the first Chinatown burned to the ground in 1878, four major Chinese employers bought land across the river from some Charles Crocker property and donated building supplies, food and fire hydrants so its residents could rebuild, he said. One of the "Big Four" of Central Pacific Railroad fame, Crocker had hired about 10,000 Chinese laborers who were primarily responsible for bringing the railroad over Donner Summit. After the arduous labor was completed, many stayed on to work in other industries. The 1870 census showed 1,400 Chinese - mostly men - living in and around Truckee. Today, leaving downtown Truckee on Highway 267 toward North Lake Tahoe, the herb shop can be seen on the left, immediately after crossing the Truckee River. It's a sprawling white structure with a tin roof, still sporting a sign for Crawford Bost, a Nevada County supervisor in the 1980s. No fewer than seven additions, along with the tin roof, have been tacked on over the years. Most are small wooden shed-like rooms, but a massive concrete-block structure was added on the east side, dwarfing the original A-frame. The largest addition was built as a warehouse for a soda-bottling company and most recently has been used as a garage. Rob McCarthy, a former Disney artist, leased the herb shop for his sign-painting business for 26 years until relocating recently to West River Street. It is the A-frame - comprising the front-central, street-level section of the building - that is of interest to John McManus, who purchased the property some years ago and plans to restore it to its 1920 condition because it isn't feasible to restore it to the 1880 condition. Most of the smaller additions will be removed. The concrete-block building will be detached. It and the original section will be leased as retail shops. Built like a fortress, the shop sold herbs and vegetables grown in a garden at the other end of the street, Jody Sweet told a gathering of the Truckee Chapter of E Clampus Vitus, which on Feb. 28 dedicated a plaque commemorating the store's history. Sweet, whose family has lived in the Truckee area since the 1860s, joined Richards and Sharon Pace Arnold, president of the Historical Society, in sharing tales of the building. The shop's attic was used for storage, while the large basement served as an opium den, as well as a gambling and prostitution parlor, said the historians. The plaque replaces an earlier one that had some errors, Richards said. He added that, despite Truckee's long cold winters, the Chinese managed to grow most of their own food and apparently even had surplus to sell. The wary builders of the herb shop constructed its brick walls 17 inches thick and installed fireproof steel doors and shutters both inside and outside of the windows. A 2-foot-thick layer of dirt on the attic floor provided insulation as well as fire protection. "As a child, I remember seeing the huge poppies that started in the Chinatown and eventually grew in almost everyone's yard," said Arnold. "We didn't know they were opium poppies." Few if any artifacts remain in the building, although it is hoped the restoration will uncover some, Arnold said. When the building was sold in the 1950s by the Engleharts, who had operated a soda-bottling company there since about 1900, there were still many artifacts, she said, "but it was all stripped out after it sold." "You have to understand, none of this stuff meant anything to anyone then," she said. "It was junk. After the war, they wanted something new." The herb shop's dirt layer was probably at least partly responsible for the building's longevity, as there is evidence of fire inside, she said. And, as recently as 1993, a heavy dirt layer also helped prevent fire from spreading in an old Commercial Row building that was leveled by a propane explosion. Arnold said McManus has done a lot of preparation and has obtained approvals. He pays great attention to detail, she said. McManus, who wasn't available for comment, has restored several other historic Truckee buildings, including the former Mercantile - now the Truckee River Llama Ranch clothing store - and has plans to restore a group of tiny former motel rooms across Jibboom Street from the post office. This article is reprinted with permission from The Sacramento Bee.